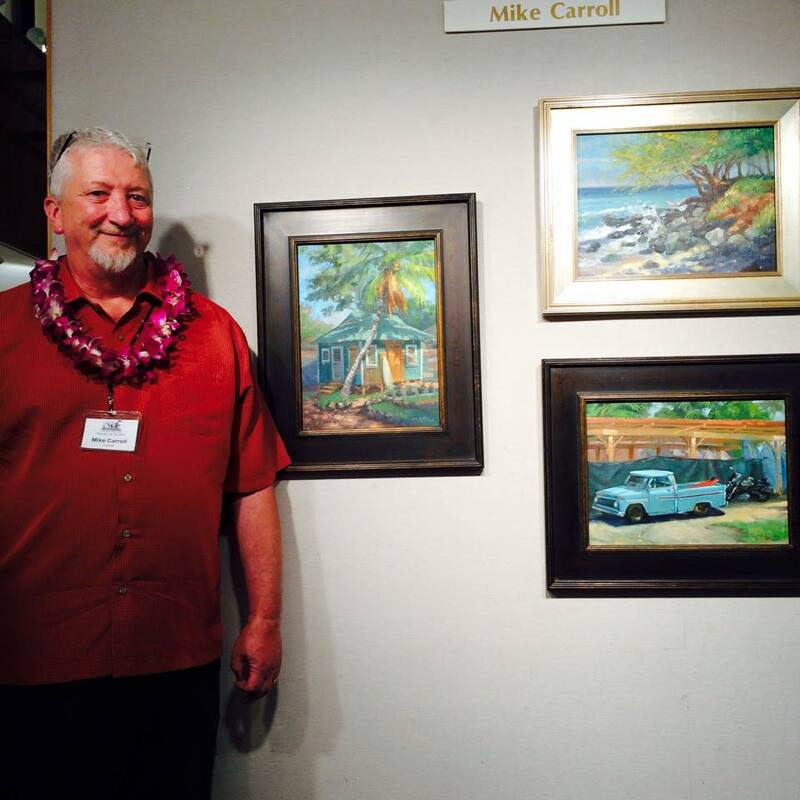 This unique experience includes a commission for an original 8×10 inch ink sketch or watercolor, scheduled Private Transfer to the Mike Carroll Gallery in Lāna‘i City for your private gallery tour and commission consultation with Mike Carroll. After your consultation you may enjoy a leisurely stroll around town and lunch at your leisure before returning to your Lāna‘i address. Optionally you may choose to add a private transfer to the Views Restaurant at Manele Golf. While there you will savor a 2 course set lunch featuring island cuisine, while enjoying the spectacular panoramic vistas overlooking Hulopoe Bay. After lunch you will be transferred back to your Lāna‘i address. Please indicate what size commission you are most interested in. Please note that additional shipping charges will vary according to commission size and destination. So that we may schedule your transfers - what is your address on Lāna‘i? In December 1999, Chicago artist Mike Carroll and his wife, Kathy, visited Lāna’i to celebrate their 20th anniversary. Within a week they made an offer on a fixer-upper plantation house and returned to Chicago to sell everything to commence a 2-year sabbatical on a quiet tropical island…Today they’re still on Lāna’i and the Mike Carroll Gallery is judged by many to be among the best galleries in Hawai‘i. 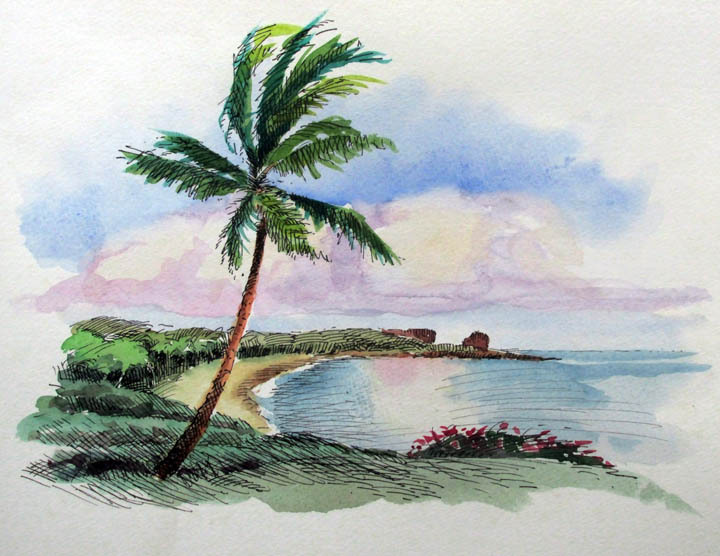 If you’ve fallen in love with a particular location on Lana’i or one of the neighbor Island this is your opportunity to let Mike turn your memory into an original sketch or oil painting! During your private visit with Mike, at the gallery, he will get a feel for the locale you are wanting to commission. After he starts your commission piece you will be sent a “photo/sketch” of the composition for approval before Mike puts brush to canvas. Mike particularly loves creating original oil paintings as a surprise for birthdays, anniversaries, or as a “thank you” gift. After a 20-year career as a medical and commercial illustrator in Chicago, Mike and his wife, Kathy, moved to Lana’i in 2001. Since then he has been selected as a Signature Member of both the Plein Air Painters of Hawaii and “Islanders” (10 artists from across Hawaii), and has been juried into all 5 Schaefer Portrait Challenges, one of 2 artists in the State with that honor. From 2010-1013 he served on the Board of Directors of the Hawaii State Art Museum.